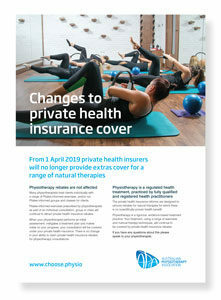 From 1 April 2019 private health insurers will no longer provide extras cover for a range of natural therapies however physiotherapy rebates are not affected. Many physiotherapists treat clients individually with a range of Pilates-informed exercises, and/or run Pilates-informed groups and classes for clients. Pilates-informed exercises prescribed by physiotherapists as part of an individual consultation, group or class will continue to attract private health insurance rebates. When your physiotherapist performs an initial assessment, instigates a treatment plan and makes notes on your progress, your consultation will be covered under your private health insurance. There is no change in your ability to claim private health insurance rebates for physiotherapy consultations. Download the Private Health Insurance Reforms Flyer.